Nicole’s research integrates evolutionary anthropology, neuroscience, and mental health. She is specifically interested in understanding the evolutionary neurobiological underpinnings of complex social behavior in humans and other primates and how neurodevelopmental processes supporting these behaviors may function differently in socioaffective disorders. 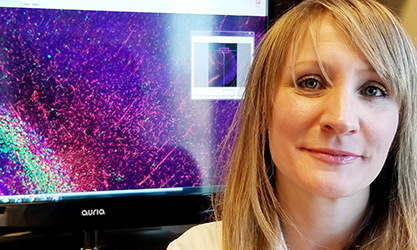 Her research seeks to address these questions by incorporating comparative and developmental neuroanatomy with multiple immunofluorescence and genomic approaches. Noctor, S. C., Shepherd, H., Penna, E., Chelson, C., Barger, N., Martínez-Cerdeño, V., & Tarantal, A. F. (2018). Periventricular microglial cells interact with dividing precursor cells in the nonhuman primate and rodent prenatal cerebral cortex. Journal of Comparative Neurology. Kreutz, A., & Barger, N. (2018). Maximizing explanatory power in stereological data collection: a protocol for reliably integrating optical fractionator and multiple immunofluorescence techniques. Frontiers in Neuroanatomy, 12, 73. Barger, N., Keiter, J. A., Kreutz, A., Krishnamurthy, A., Weidenthaler, C., Martínez-Cerdeño, V., Tarantal, A. F., and Noctor, S. C. (2018). Microglia: an intrinsic component of the proliferative zones in the fetal rhesus monkey cerebral cortex. Cerebral Cortex. Avino, T., Barger, N., Vargas, M. V., Bauman, M. D., Amaral, D. G., & Schumann, C. M. (2018). Neuron numbers increase in the human amygdala from birth to adulthood but not in autism. Proceedings of the National Academy of Sciences, 115, 3710-3715. Stimpson, C. D., Barger, N., Taglialatela, J. P., Gendron-Fitzpatrick, A., Hof, P. R., Hopkins, W. D., & Sherwood, C. C. (2016). Differential serotonergic innervation of the amygdala in bonobos and chimpanzees. Social Cognitive and Affective Neuroscience, 11, 413-22. Barger, N., Sheley, M. F., & Schumann, C. M. (2015). Stereological study of pyramidal neurons in the human superior temporal gyrus from childhood to adulthood. The Journal of Comparative Neurology, 523, 1054–72. Ander, B. P., Barger, N., Stamova, B., Sharp, F. R., & Schumann, C. M. (2015). Atypical miRNA expression in temporal cortex associated with dysregulation of immune, cell cycle, and other pathways in autism spectrum disorders. Molecular Autism, 6, 1-13. Stamova, B., Ander, B. P., Barger, N., Sharp, F. R., & Schumann, C. M. (2015). Specific regional and age-related small noncoding RNA expression patterns within superior temporal gyrus of typical human brains are less distinct in Autism brains. Journal of Child Neurology, 30, 1930–46. Barger, N., Schenker, N., Teffer, K., & Semendeferi, K. (2014). Limbic structures in human brain evolution: evidence for evolutionary specialization in the human hippocampus and amygdala. Frontiers in Human Neuroscience, 8, 277. Morgan, J., Barger, N., & Schumann, C. M. (2014). Stereological study of amygdala glial populations in adolescents and adults with Autism Spectrum Disorder. PLoS One, 9, e110356. Barger, N., Stefanacci, L., Schumann, C. M., Sherwood, C. C., Annese, J., Allman, J. M., Buckwalter, J. A., Hof, P. R., & Semendeferi, K. (2012). Neuronal populations in the basolateral nuclei of the amygdala are differentially increased in humans compared with apes: a stereological study. Journal of Comparative Neurology, 520, 3035-54. Semendeferi, K., Barger, N., & Schenker, N. M. (2010). Brain reorganization in humans and apes. In: The Human Brain Evolving. D. Broadfield, M. Yuan, N. Toth, and K. Schick (Eds). Stone Age Institute Press (4th volume). David Brown Book Co. and Oxbow Books, pp.119-55. Barger, N., Stefanacci, L., & Semendeferi, K. (2007). A comparative analysis of the hominoid amygdala and basolateral division. American Journal of Physical Anthropology, 134, 392-403. Barger, N. L., & Noctor, S. C. Microglia and their associations with neural stem cells vary spatiotemporally in fetal human and nonhuman primate neocortical neurogenesis. Program # 551.11. Neuroscience Meeting Planner. San Diego, CA: Society for Neuroscience. Online. Barger, N., & Noctor, S. C. Increased abundance and gene expression suggest brain immune cells shape the neocortex in typical human fetal development. The American Association of Physical Anthropologists, Austin, TX. American Journal of Physical Anthropology, 165: 19. Barger, N., Vargas, M. V., Avino, T. A., Semendeferi, K. S., & Schumann, C. M. Postnatal neuron increase in the adult human amygdala is more extensive than in other hominids and associated with expression of genes annotated to neurogenesis. Program # 31.15. Neuroscience Meeting Planner. Washington, DC: Society for Neuroscience. Online. Barger, N., Vargas, M. V., Avino, T. A., Semendeferi, K. S., & Schumann, C. M. Postnatal neuron number increase in the human amygdala is more extensive than in other hominids. The American Association of Physical Anthropologists, New Orleans, LA. American Journal of Physical Anthropology, 162:110. Barger, N., Vargas, M. V., Avino, T. A., Semendeferi, K. S., & Schumann, C. M. Postnatal neuron increase in the human amygdala is more extensive than in other hominids. Poster presented at the 5th Annual Meeting of the Southwestern Association of Biological Anthropologists. San Diego, CA. Barger, N. L., Sheley, M. F., & Schumann, C. M. Stereological analysis of age-related variation in the human superior temporal association cortex. The American Association of Physical Anthropologists, St. Louis, MO. American Journal of Physical Anthropology, 156:78. Barger, N., Vargas, M., & Schumann, C. M. Age-Related Decline in Neuron Number in the Amygdala in ASD. International Meeting for Autism Research: Salt Lake City, UT. Barger, N., Vargas, M., & Schumann, C. M. Developmental trajectories of neuron numbers across amygdaloid nuclei in Autism Spectrum Disorder. Poster presented at the 2014 Meetings of the Society for Neuroscience. Program # 604.14. Neuroscience Meeting Planner. Washington, DC: Society for Neuroscience. Online. Barger, N., Luong, L., Amaral, D. G. & Schumann, C. M. Investigating age-related changes in amygdala and hippocampus neuron number in autism. Program # 694.07. Neuroscience Meeting Planner. San Diego, CA: Society for Neuroscience. Online. Nanosymposium Oral Presentation. Barger, N., Amaral, D. G., & Schumann, C. M. Age related changes in neuronal populations in the amygdala in autism. Poster presented at the 2013 International Meeting for Autism Research, San Sebastian – Donostia, Spain. 2012 Barger, N., Hanson, K., & Semendeferi, K. Limbic structures in human evolution: new data and a meta-analysis. The American Association of Physical Anthropologists, Portland, OR. American Journal of Physical Anthropology, 147(S54): 90. Barger, N., Schumann, C., Stefanacci, L., Sherwood, C., Annese, J., Allman, J., Hof, P., & Semendeferi, K. A comparative stereological analysis of neuron numbers in the amygdala and four amygdaloid nuclei in humans, apes, and macaques. Program # 690.18. Neuroscience Meeting Planner. San Diego, CA: Society for Neuroscience. Online. Barger, N., Schumann, C. M., Annese, J., Sherwood, C. C., Stefanacci, L., Hof, P., & Semendeferi, K. A comparative stereological analysis of neuron numbers in the human and non-human primate basolateral amygdala. The American Association of Physical Anthropologists, Albuquerque, NM. American Journal of Physical Anthropology, 141(S50):61. *Podium Presentation. Ruth L. Kirschstein Fellowship, Autism Research Training Program, NIMH (T32-MH073124).